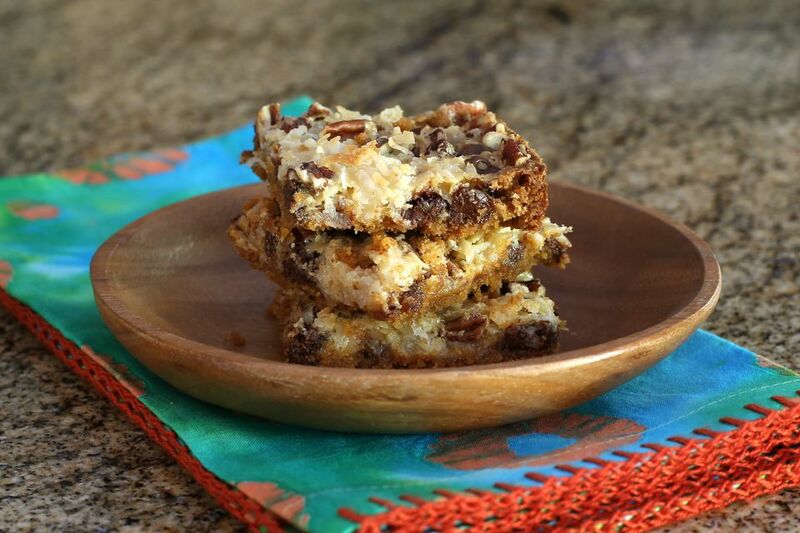 These Hello Dolly bars—also known as seven-layer bars or magic cookie bars—are made with a combination of semisweet chocolate and butterscotch chips. The bars are assembled in seven layers, and they are incredibly delicious. The Hello Dolly name comes from they being made in tribute to the Broadway play, "Hello Dolly." They go together like magic because drizzled condensed milk holds the layers together. We look forward to making these for the holidays, but you really don't need a special occasion to bake them. There's very little preparation involved since it's just a matter of layering ingredients and popping them in the oven. You can change them up a bit by replacing the butterscotch chips with more chocolate chips, peanut butter chips, or white chocolate chips. There are lots of options in the markets these days! We think toffee chips would be amazing. Or, make dulce de leche (caramel sauce) with sweetened condensed milk and use that on the bars. We've included a simple caramel how-to below the recipe but plan in advance because you will have to let the milk cook for several hours in the slow cooker. Melt the butter and then combine it with the graham cracker crumbs in a bowl. Mix well. Pat the graham cracker crumb mixture in the bottom of a 13-by-9-by-2-inch baking pan. Sprinkle the remaining ingredients over the crumbs in the order given, in layers: semisweet chocolate chips, butterscotch chips, flaked sweetened coconut, and chopped walnuts. Drizzle the sweetened condensed milk over all. Do not stir as you want the layers to be intact. Cool the pan on a rack and then cut into bars. You can store the bars at room temperature in a sealed container for up to three days, or in the refrigerator. Cook the sweetened condensed milk to make a caramel sauce for these bars. To make the caramel in a slow cooker, place a small towel on the bottom of the slow cooker and place the unopened can on the towel (to ensure the can does not stain the slow cooker). Add water to the slow cooker to a depth of 1 inch above the can. Cover the pot and cook on high for 2 hours. Reduce the heat to low and cook for about 4 to 5 hours longer. Alternatively, transfer the sweetened condensed milk to two small canning jars and cover tightly with the lids. Place them in the slow cooker, cover with water, and cook for 2 hours on high and 4 to 5 hours on high. Using jars, you can see the color of the caramel. Make these bars with 1 to 2 cups of semisweet chocolate chips and omit the butterscotch chips. Use white chocolate chips instead of butterscotch chips.